Kevin & Theresa who married in 1951. Patrick Joseph Kevin Crowley came into this world on March 17th 1921. An Irishman, born on the most auspicious of days, he was christened Patrick but was known, by everyone as Kevin. He was almost the baby of the family (only Eileen) being younger. He would tell stories of growing up in Friars Walk; of working in the garden, of Mickey the horse and his love of playing Hurling. As a child I had a rocking horse called Mickey and unusually for a boy living in London, there were always a couple of hurleys in the back garden. (with the ball invariably in next door’s garden) I have a Hurling medal dating back to 1939 when St. Finbarr’s won the Cork Minor Championship. He must have been quite a player! After Leaving Cert. he studied for a B. Comm. at UCC. After qualifying, he went to work for Aer Lingus in Dublin. I have a photo of a very young Dad, with an address in Pembroke Road, Ballsbridge, on the back. He must have lodged there. Aer Lingus were expanding their operation into the UK and they wanted a young, single man to go to London to work. Dad fitted the bill and in 1948 he came to London. He knew a family called Burt who lived in Ruislip. 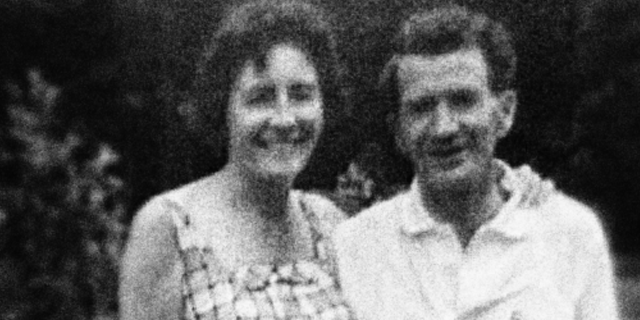 He would spend a great deal of time with them and he met a friend of the family, Teresa Sweeney. 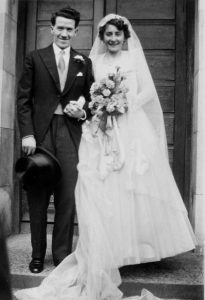 They were married in 1951, and the Burt’s daughter, Mary (now O’Connell) was bridesmaid. I came along in 1953. Dad commuted to London every day, working firstly for Aer Lingus, Dan Air and finally Wimpey Construction. Early childhood memories are always dim but two things shine through. Dad had green fingers!! Our garden was his pride and joy; a cross between Kew Gardens and Croke Park. Terrific flowers but still a place to play Hurling! Secondly, Dad loved a good debate. Coming from an Irish family, living in London, he could always be relied on to give a different perspective to the one prevalent in the British media. From him, I have inherited my love of politics, economics and current affairs. My wife says that I am argumentative; I say I like to explore both sides!! With hindsight the seeds were sown during my childhood winters. Saturdays were spent watching the 5 Nations (pre Italy) Rugby and we would deliberately support different sides. How he would love it now, with a Welsh wife and a Scottish son in law? At least we agree on everyone beating France! He may have lived in England but Dad was a fiercely patriotic Irishman. The Cork Weekly Examiner would arrive, as would the shamrock on St. Patrick’s Day and he never lost his Cork brogue. My wife is Cathy; he never mastered the pronunciation of that and she was always “Ka-te”. I can hear it now. The last years of Dad’s life were marred by terrible ill health. My mother was a saint in the way she looked after him. She let her own health slide and I found out later, left a breast cancer untreated. They died within three years of each other. Dad has been gone for almost 19 years now and thankfully the memories of him are good ones. I am determined to finish on a bright note, with two happy and thankfully everlasting memories. The first is of Dad as a Grandfather to our three children. He had the ability to walk into a room of well- behaved children and turn them into wild things in 15 minutes. He loved children and they loved him. The second memory goes back over 50 years. Dad went to America to do some work for Aer Lingus and he came back with a model aircraft he bought in New York. I was about 7 or 8 and to me it seemed enormous. Off we went to the field near us to fly it and he must have done a good job in building it as we spent the entire afternoon chasing after it. A memory from 50 years ago I will take to my grave.